While the Cassowary festival was a community celebration of the exceptional natural environment of Mission Beach, the community wanted to thank some of those who have made a significant contribution to cassowary conservation within their professional capacity. Dr Graham Lauridsen gave an informative talk on cassowary management and told stories from his personal experience as the foremost cassowary veterinary professional. Peter Garrett, the Threatened Species Commissioner, Bob Irwin and Qld Trust for Nature were not able to join us for the day. They sent us the following messages of support. While attending the World Cassowary Day event held at Mission Beach in 2015 Gregory was overwhelmed with the experience of seeing his first cassowary. He was so impressed with the commitment and passion of the Mission Beach community to protect the cassowary, he recommended it be placed on the Federal Government's 20 birds priority action list. Gregory continues to work closely with the Wet Tropics communities overseeing the actions initiated to remove the cassowary from the endangered list by 2020. While in the role of Federal Environment minister, Peter Garrett used the EPBC Act to deny development on Lot 66 because of the significant impact it would have on the endangered cassowary. Lot 66 is a crucial lot, connecting the Wet Tropics and Great Barrier Reef World Heritage Areas in the heart of Mission Beach. It is now known locally as the 'Garrett Corridor'. 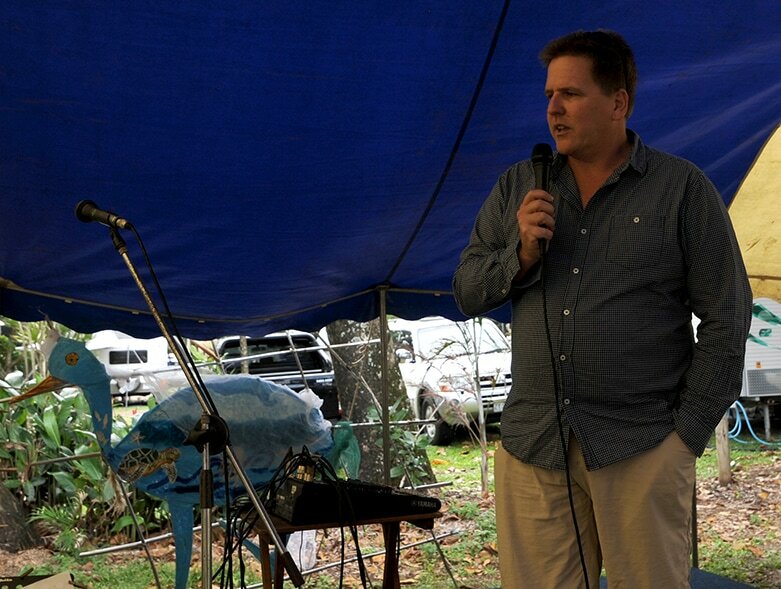 "I would like to take the time to wish everyone a successful Cassowary Festival in Mission Beach. I am constantly inspired and encouraged by the work of the Mission Beach Community in advocating for greater protection of one of Australia’s most unique and special animals. I applaud everyone who has turned out today to highlight the plight of this iconic animal and for unifying as a community for such an important cause. Mission Beach will always hold a very special place in my heart because you are a unique community who not only work together for the conservation of a species but also the protection of critical habitat. Mission Beach, in my eyes, is a wonderful ambassador for the cassowary and I only hope that other communities right across Australia can take a leaf out of your book and follow along your many wonderful achievements for our wildlife. Wishing you a successful day of raising awareness. I look forward to my next visit to Mission Beach and the far north"
While Peter Garrett denied development on Lot 66 it was still not formally protected. QTFN partnered with the Community for Coastal and Cassowary Conservation (C4) financially assisting the local conservation group to buy back the rain forest /essential cassowary habitat block.